Christmas shopping in Bath has a great atmosphere with the city's christmas lights & street entertainers. You will find small boutiques and gift shops, art galleries and antique shops. 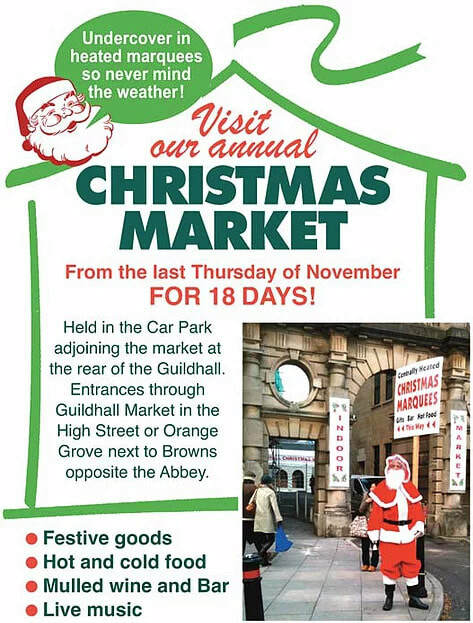 At this years Christmas Market you will find a whole host of different stalls to give you great ideas for Christmas gifts. Located next to Bath Abbey. Set against the magical backdrop of Bath’s majestic Abbey and amongst the city’s quaint Georgian streets, the market is a very British take on the usual German Christmas market and showcases the best produce of Bath and the South West. Hailed as ‘the biggest and most beautiful Christmas shopping event in the region,’ the 18-day event will be the most substantial yet, with over 150 traditional wooden stalls lining Bath’s central streets and squares. Offering an abundance of choice, providing a variety of high-quality gifts and Christmas essentials such as decorations and locally produced festive food, with a strong emphasis on handmade, local and unique items. Another highlight this year is the opening night Holburne Lantern Procession, when a throng of local children will form a parade from the Holburne Museum, along Bath’s widest and stunning Great Pulteney Street, over the iconic Pulteney Bridge and through the Christmas Market. Armed with their own handmade lanterns, the children will light up the streets as they march along celebrating the ‘feast’ of Christmas. Always romantic and traditionally festive, with tempting fare and gentle entertainment befitting the time of year, the area around Bath Abbey will play host to choirs singing carols and talented solo musicians singing festive songs. The market’s location, in the heart of the city, is perfect for visitors to enjoy all that the city has to offer – just steps away from the city’s train station, a wonderful mix of high street and designer shops, fascinating attractions and warm, inviting cafes and bars. Packed with comedy, slapstick, singing, dancing, beautiful costumes and plenty of audience participation. Thanks for sharing our poster! Hear the popular Carols by Candlelight. Two entrances: one in the High Street near Bath Abbey, the other opposite the famous Pulteney Bridge. Bath is top of the list for the region’s Christmas shoppers as it combines the festive Christmas market next to Bath Abbey, with unusual gifts in Bath independents and all the top high street brands with a picture perfect backdrop. Bath has a gift for everyone, a wide choice of restaurants and cafes and even the opportunity for some pamper time at Thermae Bath Spa after a productive day of shopping. In previous years the city of Bath has invited Bath Rugby Club (2014), Mary Berry (2013), Matt Baker and Alex Jones (2012), John Cleese (2011), The Duchess of Cornwall (2010) and Nicolas Cage (2009) to switch on the lights at the bottom of Bath’s most famous shopping street, Milsom Street. Featured in Jane Austen’s novels as the place that her heroines would pick out their fashionable gowns, today Milsom Street is the artery to retail heaven. Ministry of Burlesque Christmas Special. Book early before it sells out! A delicious evening of dancing, variety & cabaret performed by the finest performers on the circuit. The popular German Christmas Market is open in Bristol Shopping Quarter this year from November. Shoppers can enjoy the chalet market stalls selling traditional crafts, gifts and mouth-watering festive German food and drink. Visitors are invited to wander around and will find traditional German Christmas decorations, lights, nativity scenes and gifts, including wooden toys, baskets, soaps, lamps and amber jewellery. Delicious festive food and drink is on offer including the now famous gluhvein, bratwurst, waffles, liquorice, stollen cake, gingerbread hearts and candied fruit. Some of our city's best loved independent traders will be in Broadmead, right in the heart of Bristol Shopping Quarter. They'll be there every day from Friday 1 to Saturday 23 December 2017. Following the success of last year's event, the museum is once again hosting a Christmas craft fair to coincide with the Christmas displays and shops. In the Stables and Coach House mainly local craftspeople will be selling their unique handmade gifts, perfect for the festive season. Visit and browse the selection of carefully curated quality handmade products. Celebrate Christmas away from the bustle of town in this friendly festive atmosphere with free entry to fair, free parking and entrance to shops and cafe before visiting the Christmas displays in the main house. Krater Comedy Club followed by Motorcity Gold - New Year's Eve with Soul! Delicious three-course meal, three top stand-ups and a compere, followed by Motorcity Gold.